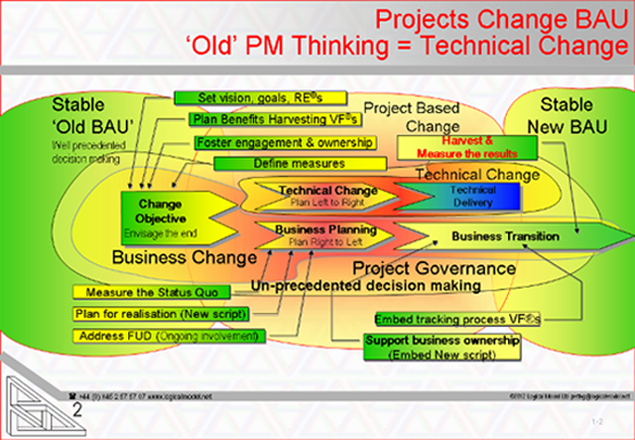 Project Management New Generation Thinking is a huge opportunity for every organisation. Improvement in any enterprise’s ability to deliver change translates straight to staff morale, customer satisfaction, the bottom line and all those metrics that are considered important. Historically project management thinking has focused on Schedules and Work Breakdown Structures. Project staff repeat a mantra of up-front clarity, left to right ‘logic’ and constancy of goal which are at odds with business reality and which makes it easy for them as suppliers to discharge an obligation and collect a fee. #pmngt integrates existing good practices, resolves contradictions and provides an holistic approach that supports the full breadth of the investment time-frame and the depth of the governance hierarchy. Much of the last 50 years of project based writing and practice has been created and used by suppliers. What exists is at its core mostly reliable but at its edges, where it comes into contact with ‘the-real-world’ the interface is far from seamless. The discontinuities and tensions between investor needs and supplier needs are a wellhead of disappointments and broken promises. Resolution is easy! Resolution requires some tweaks to attitudes and the addition of thinking aids (tools and techniques to frame scope, handle mistakes, describe options and intentions) on both the supplier and investor sides of the change equation. pmngt’s breadth is from stable business as usual to stable business as usual. The technical change is just a small (and often the easiest) part of the total journey. #pmngt explicitly addresses horizontal dialogue in each layer and the escalation upwards as additions to the better understood traditions of delegation.